This comforter has been successful year after year as it has been featured in Marriott � Hotels and Resorts worldwide. It has kept skiers warm on the coldest nights in Colorado and has also been perfect for snuggling while watching the sunset in the Caymans. 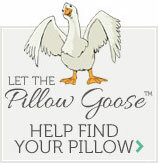 Try the Pacific Coast Feather Company � White Goose Down Comforter and experience comfort and warmth tonight!